Sussex pub walks, perfect for a weekend stroll! Getting out into the great outdoors is a fantastic way to spend a day. One way to make a country walk even better is to ensure that it ends at, or takes in a few, country pubs. The feeling of earning your lunch by ambling among the hedgerows cannot be beaten, and here in Sussex we have numerous opportunities to do just that. The Sussex downs is awash with rambling opportunities, and with its plethora of picturesque public houses you can finish by rambling on next to a log fire or in a garden with a view with a drink in hand. 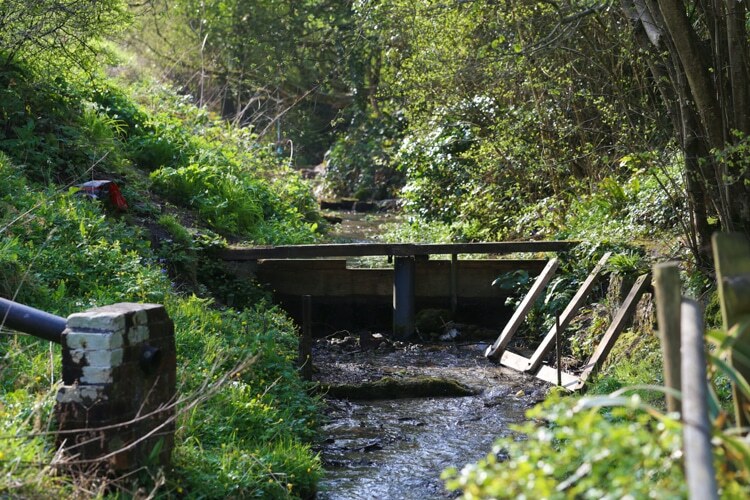 We’ve put together our list of top Sussex strolls that take in one of our favourite drinking holes. When you next feel the need to break the daily grind and escape the bright lights of the city, why not give one of our Sussex pub walks a try. The Shepherd and Dog is Brighton’s nearest country pub, and a fabulous location for a walk. 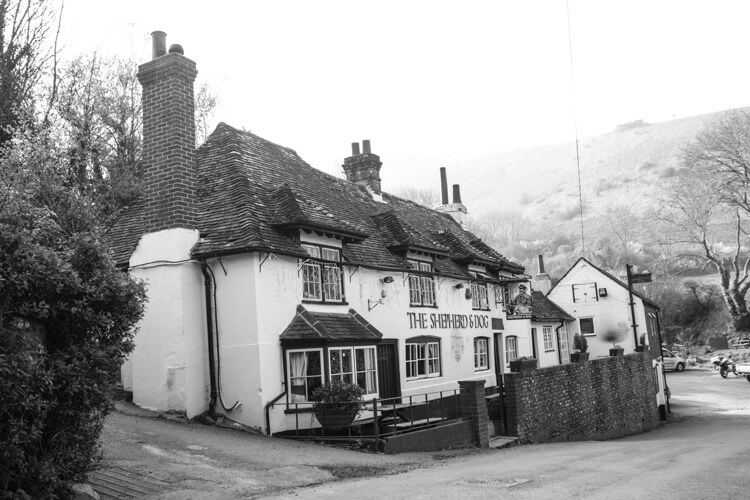 There are a few options from this pub with its proximity to Devil’s Dyke the obvious choice. Your first option is to grab the bus from Brighton up to Devil’s Dyke, then make the lovely walk down to the pub from the top of the Dyke. This is ideal for those without their own transport, and you can return by the same route no matter how many delightful beers you get through. The pub also has two walks that start and end at the pub. The first heads up and over the Dyke, taking in some of the same route you would do from the top of the Dyke, and joining the South Downs Way. The Fulking Circle heads in land in a three-mile loop through the local countryside. For the routes follow this link and be sure to grab your map and compass. 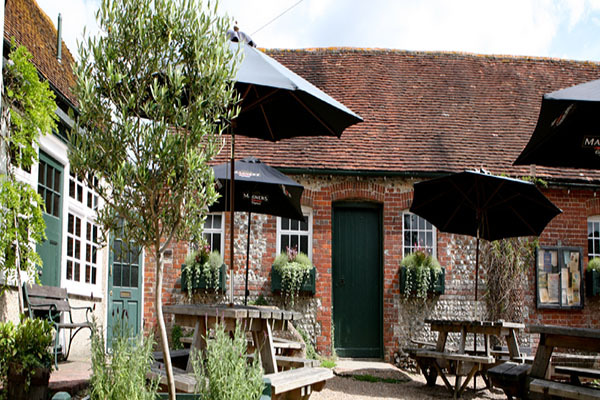 Sitting right at the foot of the famous Longman of Willmington is The Sussex Ox Farm and Pub. 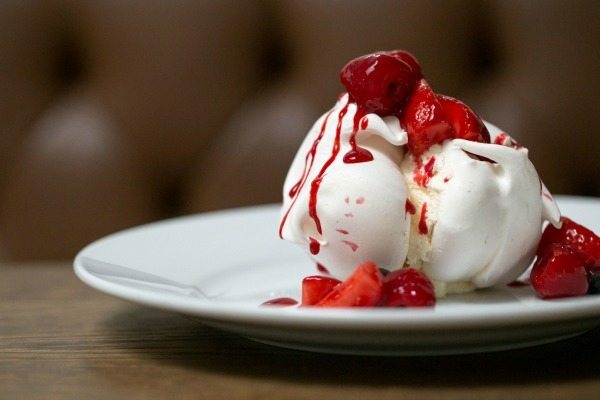 The pub offers a delightful traditional feel with its low beamed ceilings, a characterful bar and mismatched furniture, however, a dark and dingy pub this is not, with large windows offering beautiful light and stunning 360 views of The South Downs. 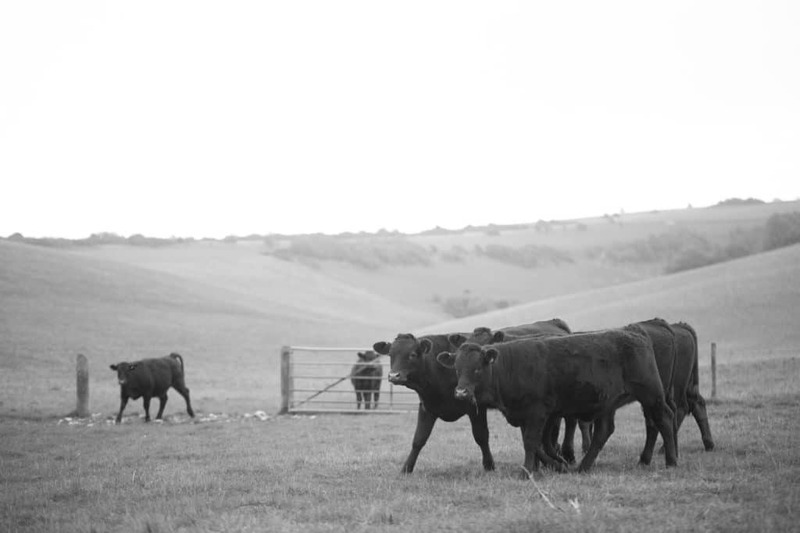 Only slightly off track from the recommended walks, The Sussex Ox is a mere 15-minute walk from The Long Man, offering a circular walk staff will gladly advise from their car park. The walk, which is around 3.5 km, is mostly flat or downhill, with only one incline to reach the Long Man himself! Perhaps visit on a Saturday lunchtime for a pre-walk meal with the dog? 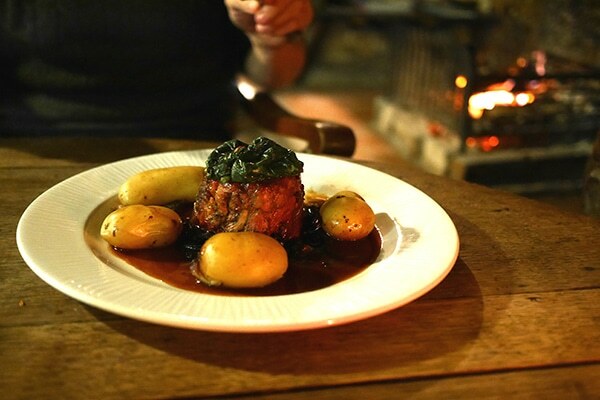 Or for one of their well known Sunday Roasts featuring meat from their own farm just 2 miles away from the pub itself. No time for food, no problem. 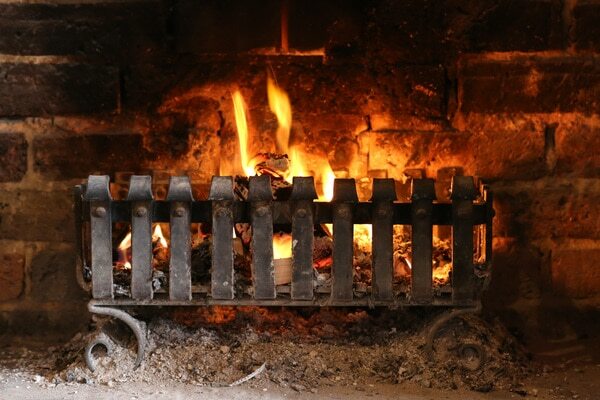 The Ox offers a fantastic array of craft beers, organic wines, local brews and in the winter homemade mulled wine and cider can be enjoyed in front of their wood burners! Do make sure you book in advance for eating as this pub it is a popular choice for delicious food and drink in East Sussex. 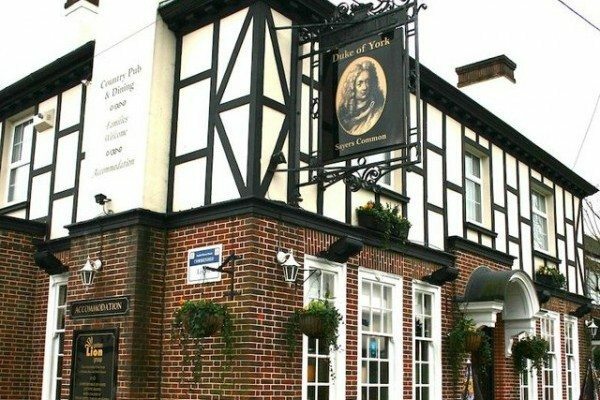 The Fountain Inn is a fabulous country pub that was made famous by the Paul McCartney song “Wonderful Christmas Time”. The pub has all the trappings you could expect from a countryside boozer. Flagstone floors and inglenook fireplaces appear throughout and the beautiful garden and duck pond are wonderful in the summer time. As far as the walk goes this is one that we have found online and cannot improve on. It is not a challenging walk, but is fairly long so make sure you give yourself time to complete it. Starting and ending at the pub, meaning you can park up and perhaps even enjoy a pre-walk pick me up, it takes in some of the fantastic local countryside. View over the downs and of Chanctonbury Ring give it some visual appeal, and the potential stop at Wiston tea rooms keeps the sprits high as you go. For the full walk map and information follow this link. The Anchor Inn is a fabulous pub that is tucked away at the end of an unassuming country lane. The pub appears at the end of the lane, on the banks of the river Ouse, and as there is no through traffic this is a tranquil and beautiful spot to enjoy a drink and bite to eat. The circular route starts at the pub and is about 3 miles in total. You will enjoy lots of lovely Sussex countryside and the regular sight of the Ouse makes it a really fantastic walk. The pub has great food and you can even hire a boat to enjoy some time on the river once you finish. If you are really looking to get away from it all, the pub also has a riverside chalet that you can rent for the night. The direction for this walk are a little old but you know what they say, the oldies are goodies. For full details follow this link. 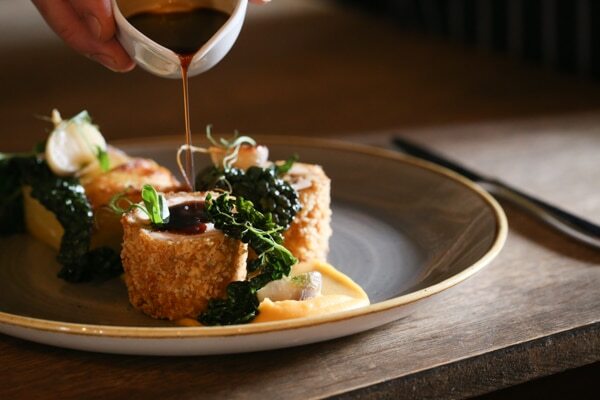 The Crown Inn at Horsted Keynes is a gastropub that serves superb food within the confines of a beautiful 16th Century building. The casual gastropub atmosphere is ideal for those looking for a touch of quality at the end of their walk, although you may want to make sure you have a change of footwear on muddier days – or even better take a room and get washed and changed before enjoying your post walk refreshment. The village is close to the Bluebell Railway and this is where your walk will head to from the village. If you time your walk correctly you will be able to catch the sight of the train in action, or at the very least see one in the station. At certain times of year it is worth heading into the fields of bluebells should they be in bloom, but it is still a lovely walk any time of year. For the full route and directions head over to this page. Lindfield is a picture-perfect Sussex village centred around an impressive pond in the centre of town. A walk around the village would be pleasant enough, but you can head a little further if feeling ambitious. The walk starts and ends on the high street, and this is where you will find Limes. 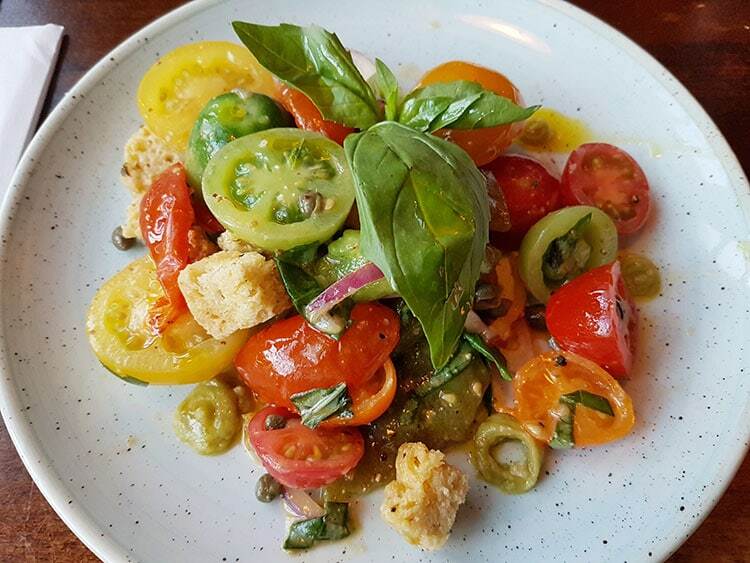 Not strictly a pub walk, Limes is well worth a visit for their superb modern British food with an Asian influence. You will need to give yourself a couple hours for this one, and you will get to see some of the historic buildings that make up the village of Lindfield. Directions for the walk can be found here. When your country pub is situated opposite the grounds of a massive Sussex hotel with acres of grounds you know it is going to attract walkers. For the Crabtree Inn in Lower Beeding this is exactly the case. 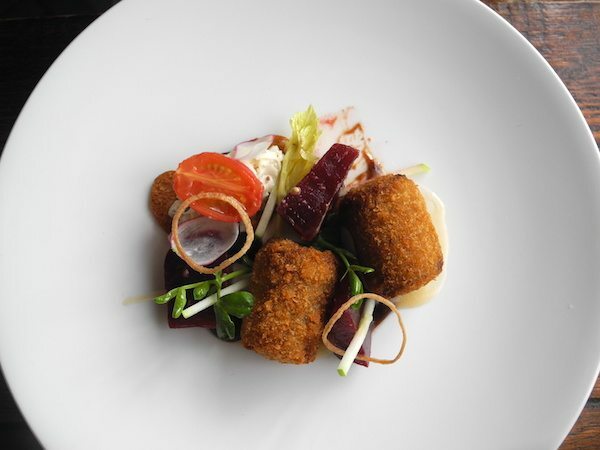 Just across the road you will find South Lodge Hotel, home of former Michelin starred restaurant The Pass, which is situated in 93 acres of beautiful grounds. If the hotel grounds are not your thing then you could also try this Cowfold walk around the local area that takes you slightly off the beaten path. Either option is a superb way to spend a day, and finishing up at The Crabtree (or even South Lodge) is the perfect end. 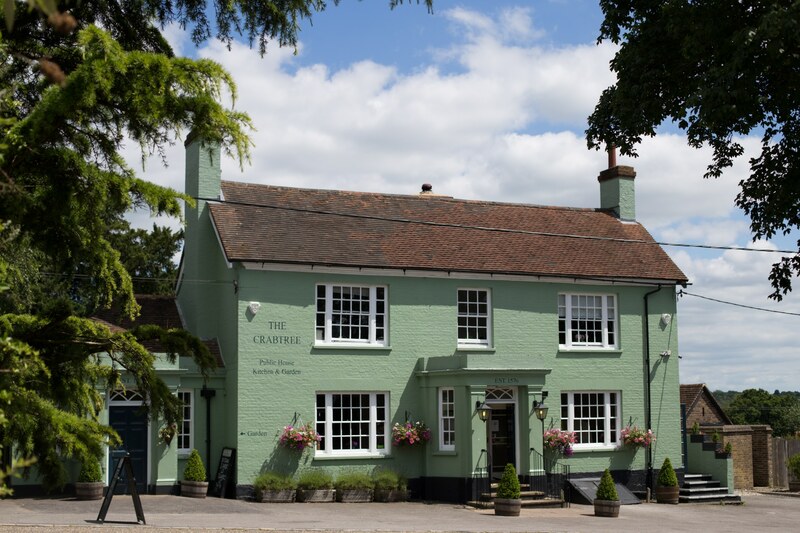 The food at The Crabtree is excellent and their selection of real ales, beer and wine is best enjoyed in their beautiful garden – weather permitting. Just over Devils Dyke, and close to the villages of Hurstpierpoint and Henfield you will find Wickwoods Country Club. This area is surrounded by beautiful woodland and country tracks that traverses the fields of the area. Not strictly a pub, but the glass house restaurant does put out a great Sunday roast, the purists could head instead to The Ginger Fox just down the road. Our favoured starting point for a walk is from Hurstpierpoint where you head towards Albourne and then along Church Lane towards St Bartholomew’s church. From here you can follow the trail right through to the beautiful Albourne Vineyard and Bedlam brewery site – be sure to visit the shop if open for some goodies. From here continue through to Shaves Wood Lane and turn left down to Wickwoods or The Ginger Fox a bit further along. This non-circular route does raise a few issues, mainly how to get back, but once you’ve fed and refuelled you will be ready for the walk back to Hurstpierpoint. Time to get back to one of those lovely circular walks which start and end at the pub, just in case some of the party don’t fancy the walk and will save a table for the others on their return. 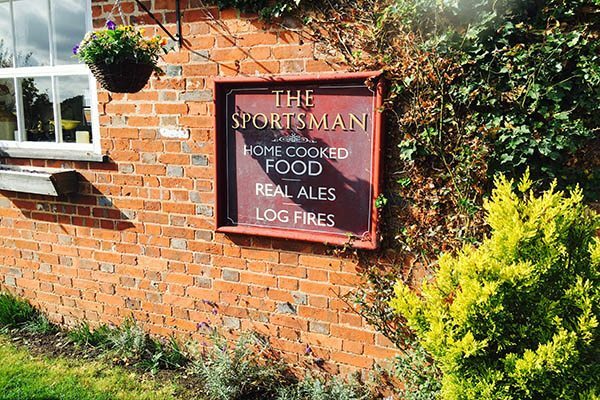 The Sportsman pub in Goddard’s Green dates back to 1800 when two older pubs were knocked through to create it. The pub is popular with ramblers, dog walkers and cyclists thanks to its superb location between a number of Sussex towns and villages and is well served with access routes. The large garden and superb locally sourced food and drink is another major pulling point. The pubs own walk is as good as any and their suggested route can be found here. The four mile walk takes in some great sights and is fairly easy going. Give yourself two hours to complete it, plenty of time for those staying behind to have warmed your seats for your return. The area around Firle Beacon offers some of the most incredible view of The South Downs and Lewes in the county. This makes it a very popular walking area, which is fine as it is also huge so there is plenty of room for everyone. Our walk starts at Firle Beacon car park, which if you’re lucky is somewhere you can view hang gliders and all manner of interesting types. It then circles around the area through Alciston and Charleston House, an area that is famous for its links to the Bloomsbury Group. Continue past here and head to Firle Place, a beauty country house and gardens that are worth a visit. You will also find your pub stop here. The Ram Inn is 500 years old and feature flint and brick walls and woodfired rooms inside. Boasting a wealth of local produce and ales it is an ideal pub stop on any walk. 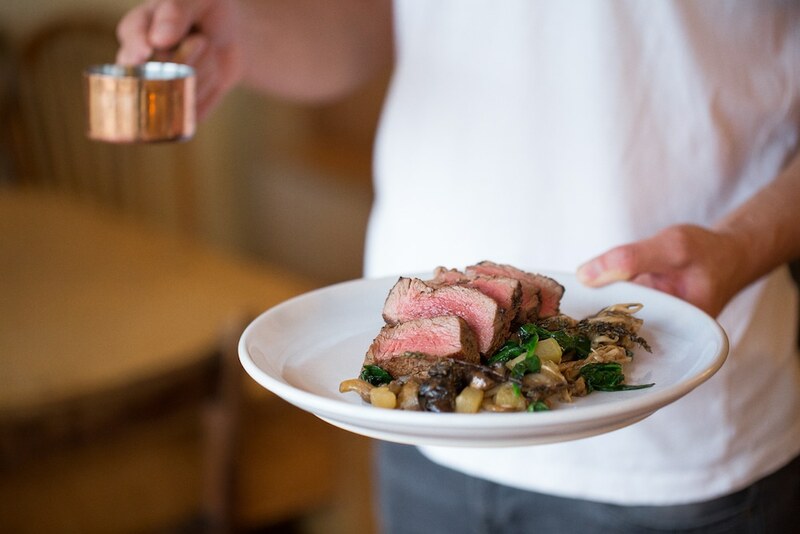 The lamb, beef and game are all incredibly local – you probably just walked past some of them, and the food is superb. From here you can either head straight back up the beacon or continue on a loop up Beddingham Hill and back to the South Downs Way to the car park. Full route map can be found here. The Bull in Henfield has all the hallmarks of a country pub. Its massive beer garden welcomes walkers, families and all as a place to rest and enjoy a spot of sunshine. Unlike a traditional pub, The Bull is known for its extensive pizza menu, perfect food for a refuel after a long stroll. Henfield is ideally situated for walkers, with the village ideally situated for access to the countryside and the river Adur to the west. This walk takes in both the Bull and another pub, in case you require a midway stop, and at 5.5 miles is a great few hours out and about. The walk focusses on the River Adur, so be careful if the weather has been wet as it could be slippery out there. Starting and ending at the parking area near The Bull, this is a fabulous walk with the promise of pizza at the end. The Duke of York is a situated at the heart of Sayers Common, giving walkers an ideal spot for heading out into the countryside. This traditional country pub offers a comforting spot to base your walk around, with home cooked pub classics and a range of real ales on offer. It’s credentials as a walkers haven are further enhanced by its dog friendly policy, and if you want to make a weekend of it accommodation is also available. Situated just off the A23, Sayers Common is an easy place to get to for drivers. The six mile walk should take around three hours, and takes in some of the local sights such as Twineham Place. It is fairly flat but can get overgrown in places, all in a days work for a serious walker. Full route description and map can be found here. Rottingdean is a beautiful seaside village that boasts plenty of history for its small stature. The village was established in Saxon times, centred around the beautiful village duck pond. In later years its secluded nature gave rise to artists and writers going there to seek refuge, the Kipling gardens are still a main attraction. It also has a history of smuggling and other activities, no seaside village worth its salt wouldn’t. The Plough Inn is a beautiful pub at the heart of the village, right next to the village pond and opposite the beautiful church of St Margaret’s. This walk is a simple one, yet offers delightful views of the Sussex coast. It makes the most of Rottingdean as a destination, making it the mid-point rather than the end. Starting at Brighton Marina, walk along the undercliff to Rottingdean stopping for an ice-cream or cup of tea as you go at the undercliff café. It is a walk all Brighton residents know, but it is a great one, and you can jump on the bus home again if you decide to linger at the pub a little longer.